Drew Brees had a lot on his plate this offseason, and used an unusual method to prepare for this upcoming NFL season. The Saints star quarterback will embark through the Panamanian jungle — and catch a live crocodile. Based on some sneak peeks of the show, Brees conquers the croc after pouncing on its back. He also goes rappelling into a cave while navigating the jungle with the survival expert. The two also appear to be using a deflated football as a base underneath the rope. The episode is scheduled to air at 10 p.m. ET. Get your game face ready. 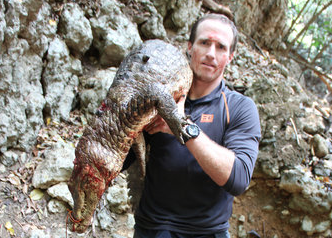 Drew Brees is joining Bear Grylls tomorrow on Running Wild. Tonight at 10/9c, Drew Brees and Bear Grylls will brave bat-filled caves and crocodile-infested waters. Game on!